The surface of these bottles, presented by Ranbir Singh, Maharaja of Kashmir (1830–35), is engraved with stylised poppy flowers and overhanging cypress trees. This design became known as ‘shawl patterning’ in reference to the famed Kashmir shawls, which feature similar motifs. 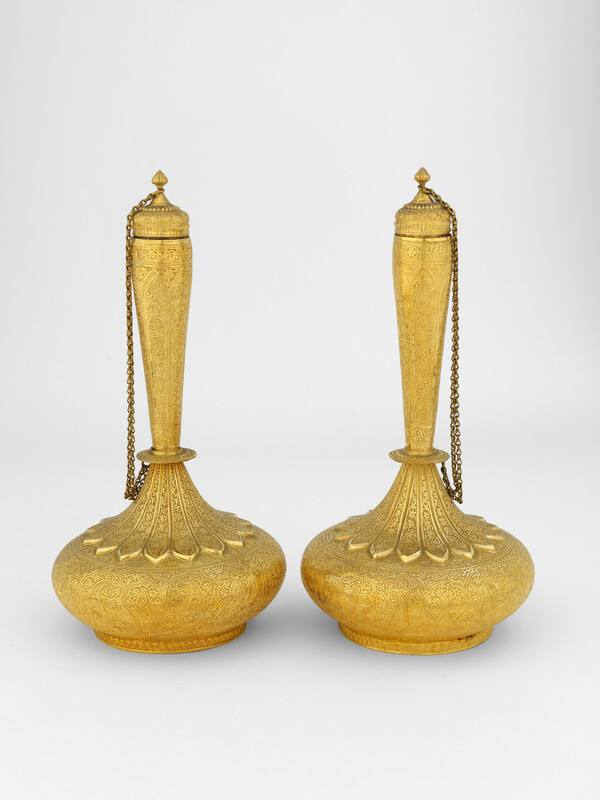 From 1887, increasing numbers of European visitors chose to spend their summers in Kashmir rather than Simla, and the silversmiths began to use ‘shawl’ patterning to embellish tea caddies, cigarette cases, trophies, beakers and tea sets for these new customers. In Britain, the Birmingham-based firm Elkington and Co. sold Kashmir-inspired silverware and electroplates of copperwares from Kashmir.